Good afternoon ladies and gentlemen. I would like to begin by paying respect to the traditional and original owners of the land in this area – the Mouheneener people – paying respect to those who have passed before us, and acknowledging today’s aboriginal community. It is a great pleasure and an honour to have been invited by Emeritus Professor Richard Fotheringham to launch the book that he has edited – The diary of Philip Thomas Smith on board the Royal Admiral en route for Van Diemen’s Land 27 November 1831 – 8 April 1832. Many people in Hobart are conscious of the Philip Smith Centre on the Domain but I suspect that not many know very much about Philip Smith. He was an English gentleman who served for a short time in the Royal Navy, left the sea to become an articled clerk in London, completed his articles, practised as an attorney for a time, and then decided to emigrate to Van Diemen’s Land. The voyage took just under five months, during which he compiled a diary which has now been published for the first time. It seems he was not short of funds. He sent £5,000 via the Colonial Agent to invest in the colony and brought three employees with him (as steerage passengers): a general servant, a man to tend his horses, and an engineer to assemble and operate a small steamboat that he brought with him, in a dismantled state. On arrival in the colony, he was admitted to practice in the Supreme Court of Van Diemen’s Land, but he soon left Hobart to devote his time to farming on land that he acquired near Ross. In his later years he was not only a gentleman farmer, but also a prominent social reformer and philanthropist. He died in France in 1880. In 1877, before leaving Tasmania for the last time, he invested £1,000 in a trust for the purpose of training teachers. With a further £500 donated by his daughter, the Philip Smith Training College was opened in January 1911. I first met Richard Fotheringham several years ago. He and I both attend judges’ conferences. 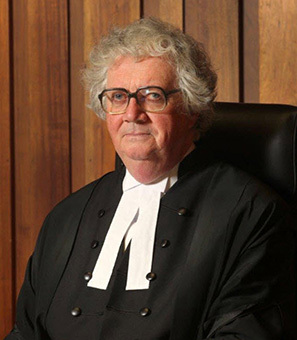 Richard’s wife is my colleague Justice Roslyn Atkinson from the Supreme Court of Queensland. Richard is a former Dean of Arts at the University of Queensland. He worked in professional theatre before going to the University of Queensland in 1979 to teach theatre studies, film and television. He has a special interest in early Australian plays. He has won an award for his book, “In Search of Steele Rudd”, published by the University of Queensland Press. But he is here today in his capacity as the great-great grandson of Captain David Fotheringham who captained the sailing ship the Royal Admiral which brought Philip Smith to Van Diemen’s Land 185 years ago. Captain Fotheringham’s younger brother, Peter, was also on the ship as the second mate. He would have been Richard’s great-great-great uncle. The manuscript of Philip Smith’s diary is publicly available in the Tasmanian Archive and Heritage Office. In fact it is one of its treasures. It is clear that the publication of this diary has involved an immense amount of work, in a number of ways. Simply deciphering Philip Smith’s handwriting must have been a very slow and tedious task. Writing with pen and ink aboard a sailing ship in a rolling sea using an 1830s vocabulary did not make the task of a 21st century editor particularly easy. Richard has obviously spent a lot of time making sense of words and sentences that are barely legible, but he has also gone to a great deal of trouble thoroughly and carefully annotating the text for the benefit of modern readers. The result is a publication that provides a very thorough insight into all aspects of long-distance sea travel in the 1830s, as well as entertaining comments about the fellow passengers and the crew. The ship set sail from Gravesend on 7 November, but had to spend two weeks at anchor off the Isle of Wight because of bad weather, and consequently did not leave England until 27 November. After that the ship put into only one port before reaching Van Diemen’s Land, on an island named Santiago in the Cape Verde Islands – a Portuguese colony where the ship took on provisions, including oranges priced at two shillings for 100, as compared with threepence each in Covent Garden. On 4 January the ship crossed the Equator. Smith described an alarming ceremony with the crew members dressed as King Neptune and various other characters including a barber, a monkey and a bear. It seems to have been an opportunity for crew members to humiliate and assault those who had not previously crossed the Equator, including all the paying passengers, whatever their station in life. Smith wrote of such a ceremony on another ship two years previously that resulted in two men being “under the Doctor’s hands for 6 weeks”. Smith also wrote a great deal about his attempt to transport a number of horses to Van Diemen’s Land. None of his horses survived the bad weather early in the voyage. He was obviously very troubled by the suffering of the animals for whom he was responsible. Some things have changed, but not all. The Court is busier, but there is still very little “chancery” work, and occasional outbreaks of triviality. One of my favourite passages in the diary concerns a sermon. Philip Smith was a devout member of the Church of England. There were no clergy on the ship, but every Sunday a service was held in the cuddy – the room in which the officers and the 14 cabin passengers took their meals. Published books of sermons by prominent churchmen were carried on the ship. At each Sunday service, one of the passengers read one of the sermons. On Sunday, 8 January 1832 Philip Smith made the mistake of choosing a sermon at random and commencing to read it without first investigating its contents. Richard’s research has established that it was a sermon preached by Bishop Samuel Horsley on 22 April 1795 in London at the Magdalen Hospital for Penitent Prostitutes. He noted in a footnote that the sermon “begins with an exhortation for general self-control then becomes specifically a tirade against sexual lust in both men and women”. I hope that I have whetted your appetite. This is a very interesting little book. It gives me great pleasure to declare it launched in Tasmania.